These are the Great War medals of Matron Ida Greaves of the Australian Voluntary Hospital, Wimereux France. Left to right, they are the Royal Red Cross 1st Class, 1914 Star, British War Medal and Victory Medal. This set of medals is exceptional not only because the Royal Red Cross 1st Class was only awarded to approximately 44 Australian women during the course of the War but because this particular medal was one of the first two to be awarded to an Australian. Matron Greaves and Matron Nora Fletcher BRCS of Sydney received their awards at Buckingham Palace on 12 July 1915. 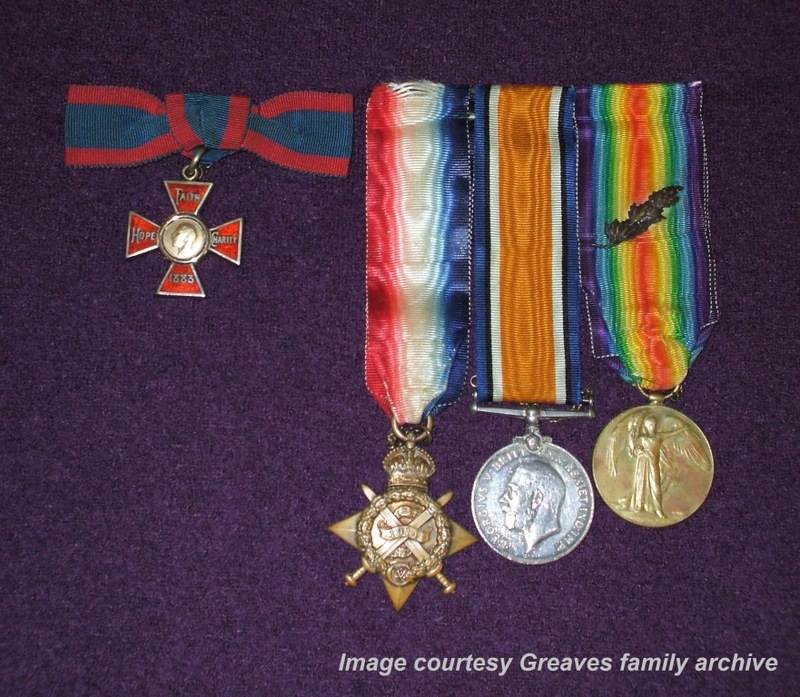 Medals of Matron Ida Greaves, RRC. Courtesy Greaves family archive. The Sydney Morning Herald reported the award on 25 June 1915, p5, with the comment that “Nurse Greaves is a native of Newcastle and is very well known here.” What a pity that the memory of this exceptional woman seems to have faded, unlike that of the Hunter’s Victoria Cross recipients. This entry was posted in Awards, Great War - First World War - 1914-1919, History, military nursing on 29/05/2013 by Great War Nurses from Newcastle & the Hunter Region. Additional information on Sister Kitty Hughes Thomas provided today by Patricia – see comment on About page. This entry was posted in Great War - First World War - 1914-1919, History, military nursing on 27/05/2013 by Great War Nurses from Newcastle & the Hunter Region. Visitors to this website have enquired regarding buying a copy of “Sisters of the Valley – First World War Nurses from Newcastle and the Hunter region”. You can download an order form from the website of the Royal Newcastle Hospital Graduate Nurses’ Association – www.rnhgna.com or call in to Local Studies at Newcastle Public Library, Laman Street, Newcastle. This entry was posted in ambulance trains, Anzac, Awards, Great War - First World War - 1914-1919, History, military nursing, Uncategorized, Women on 24/05/2013 by Great War Nurses from Newcastle & the Hunter Region.